Significant new investment in cycleways means the Dunedin City Council could build a track from Green Island to Mosgiel, and link the city and St Clair. The council help with a trail that will run through the former Chain Hills rail tunnel has pleased Dunedin Tunnels Trail Trust chairman Gerard Hyland, who has been working on, and raising money for, the project. "I'm thrilled, Mr Hyland said. Council transport group manager Richard Saunders said the council had learned from its troubles building a botched cycleway in South Dunedin. Future projects, he said, would be fit for purpose and in the right location. The council will discuss a report on the Dunedin urban cycleways programme next Tuesday. The programme includes plans to build the tunnel track, provide a connection from the city to St Clair via Hillside and Forbury Rds, and improve cycle infrastructure in Northeast Valley and in the Wharf St, Thomas Burns Dr and Portsmouth Dr area. Staff will submit the programme to the NZTA for approval. Mr Saunders said the tunnel trail had been included in part because of the work the trust had done to secure the land and initiate conversations with KiwiRail. The trust raised $500,000, spent money on property and built part of the track at the tunnel entrance. "It's at the point now the project can go ahead," Mr Saunders said. The council's funding would come from its $20 million cycleway budget, but with financial support from the NZTA. The cost of the trail work, its timing and the level of NZTA funding was not yet known, though in the past the agency had provided 66%. If the NZTA approved the programme, the council would begin planning individual projects and develop costings. 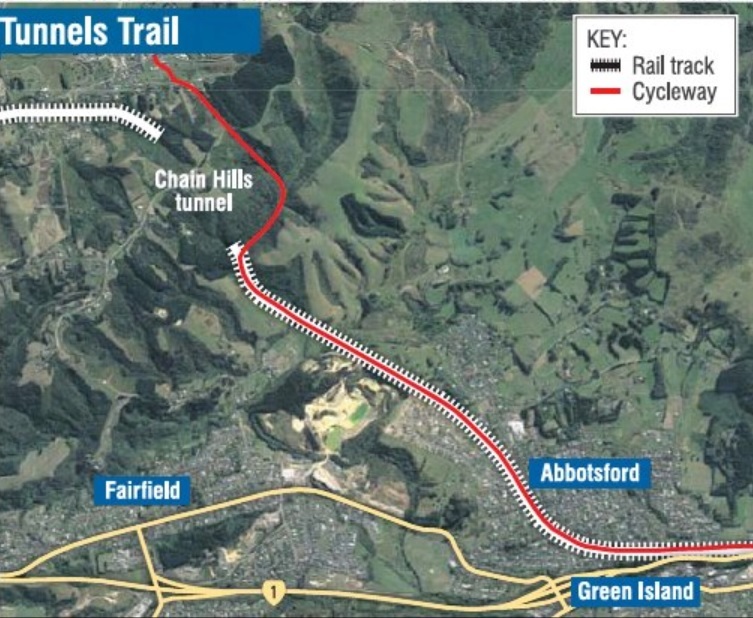 The tunnel trail would also require agreement with KiwiRail, so there was no time frame for the work. "If the programme's approved, and we move into design work, then we would be starting to understand what our time frames are." The St Clair link had been identified as an important connection for commuters. The Hillside Rd/Forbury Rd route was "only indicative" and would be considered further during design and planning. NZTA cycle funding would support all projects. "We just want to get under way so we make the most of that funding." Not all the projects would be separated cycleways. Mr Saunders said lessons had been learned from the bungled cycleways in South Dunedin that were built, then removed after design faults emerged. "We're very aware of those issues, and make sure we consider them carefully through planning. "I would be confident in future when we do commit to a cycleway project it's the right level of service in the right location." Mr Hyland said the trust was working to subdivide property at the Wingatui end of the tunnel so it would be protected. The trail would be on the Abbotsford side of State Highway 1, after which there were existing cycleways accessing Green Island and Kaikorai Valley. Once it was built, the trust would provide amenities such as signage, picnic spots, rest areas and information boards, and the long-term plan was for the council to take over its maintenance. The trust had an assurance it would become part of the New Zealand Cycle Trail. "We would have the branding, we would have the recognition, and it would be Dunedin's proper link to the inland cycleways." Why would you want to build a cycleway from Portsmouth Drive down Hillside Road/Forbury Rd when you can cycle the quicker route down Queens Drive from the new cycleways down to the beach at St Kilda and the along to Esplanade? Are the planners on the same planet or do they not know a Dunedin? North East Valley cycle way already works (aside from the big lump of concrete plopped in the middle of the road by the quarry store) so leave it alone. It's about time funding was spent on the actual road surfaces that motorized traffic use, after all it is those users that pay the bulk of the money towards it's upkeep (or lack thereof). This is fantastic news for ALL road users who travel from Mosgiel to the city regularly. Traffic congestion is on the rise and cyclists and drivers sharing the road isn't easy. This pathway will address both issues by seperating and encouraging cycling. Also what a fantastic use for otherwise wasted infrastructure, and opening up some of Dunedin's history for full view again. Well done DCC and well done Mr Hyland! Great news, looking forward to seeing the Tunnel Trail link up and running, it'll be a while yet, but surely will be worth the wait.